This week, over 5,000 men and women will come together at The United State of Women Summit to celebrate our efforts in advancing women globally and creating solutions for the challenges ahead of us. As the Founder and CEO of Girls Who Code, it’s an enormous honor to speak at the Summit about educational opportunity for women — particularly in science, technology, engineering, and mathematics (STEM) fields, an issue close to my heart. Last year, there were over 600,000 tech jobs open across the United States, and by 2018, 51 percent of all STEM jobs are projected to be in computer science-related fields. And yet, women are largely absent from these rapidly growing fields. For example, in high schools that offered any Advanced Placement (AP) computer science courses in 2015, only 22 percent of those who took the exam were girls. When I founded Girls Who Code in 2012, I did so with one single mission: to close that gender gap in tech. Over the past four years, we’ve gone from 20 girls in New York City to 10,000 girls across 42 states. That’s the same number of girls who graduate each year with a degree in computer science. By the end of this year, we’ll have taught 40,000 girls as we expand our Clubs program to every US state. We’re no longer just talking about closing the gender gap in tech — we’re actually doing it. The idea for Girls Who Code came to me during my Congressional race in New York City. On the campaign trail I would visit schools all across the city and every computer science classroom I’d walk into I’d see a sea of boys and maybe one or two girls. The question “Where are the girls?” stuck with me, and after losing the race I decided I wanted to focus my efforts on addressing the barriers getting in the way of girls pursuing a computer science education. 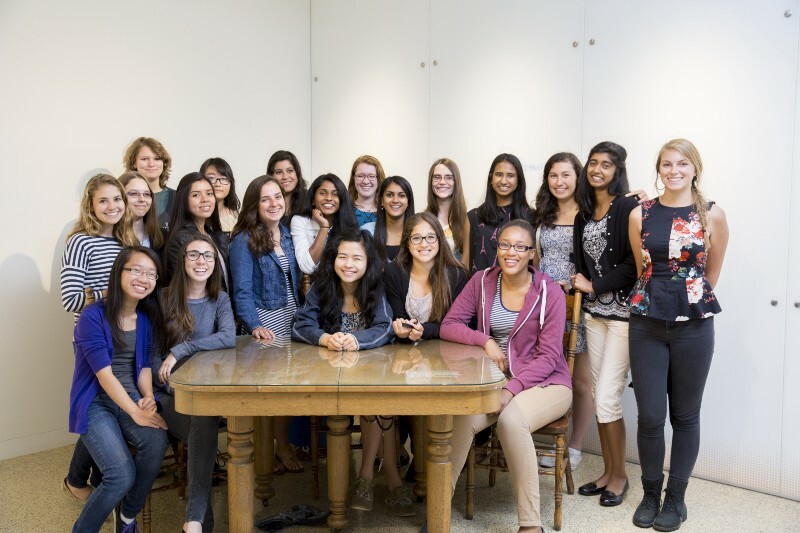 Girls Who Code was born out a desire to not just teach the hard technical skills through our Clubs and Summer Immersion Program, but to address the social and cultural barriers girls face. We nurture a sense of sisterhood among our girls so they feel less alone, we introduce girls to role models to help guide them and offer advice, and we work to shift the cultural conversation around what a computer scientist does and looks like. And we’ve learned a lot along the way. As it turns out, perfection, is another barrier to getting girls into the pipeline. Studies show we socialize our girls to be perfect in a way we don’t socialize our boys and, in an innovation economy, which means girls are missing out big time. In the 1980s, for example, psychologist Carol Dweck looked at how bright fifth graders handled an assignment that was too difficult for them. She found that girls were quick to give up. In fact, the higher their IQ, the more likely they were to give up. Academically successful boys, on the other hand, found the difficult material to be a challenge. They found it energizing and they were more likely to redouble their efforts. Boys are taught to play rough, swing high, crawl to the top of the monkey bars, and then jump off head first. Girls are taught in too many instances to get all A’s, smile pretty, and play it safe. By the time they’re adults, whether they’re negotiating a raise or even asking someone out on a date, men are habituated to take risk after risk. They’re rewarded for it. It’s often said in Silicon Valley that no one even takes you seriously unless you’ve had two failed startups. So, those 600,000 jobs that are open right now in computing and technology? Women are being left out of them all too often. One unexpected outcome with our programs that I’m proud of is that, by teaching girls to code, we’re socializing them to be brave. The process of coding is a process of trial and error with sometimes just a semicolon making the difference between success and failure. Code breaks and falls apart. You can’t approach it with the mindset that you’ll never make a mistake, because you will. We see girls immediately struggle with this when they start our programs. A student will call over the instructor to a blank text editor and say she doesn’t know what code to write. If the instructor didn’t know any better, she would think the student had spent this time staring at the screen, but in fact, if the instructor presses “UNDO” a few times, she will see the student wrote code and deleted it. She didn’t get it exactly right, so instead of showing progress she’d rather show nothing at all. Perfection or bust. It has nothing to do with intelligence, it has to do with how she feels about failure. Now imagine if girls felt empowered to fail? How could that change the trajectory of her learning experience? What new doors could that open for her? Whether it’s a new coding class, taking up a new sport, speaking in front of her class , imagine if she could approach that challenge from a place of excitement — like our boys in Dweck’s study — rather than fear? Our global economic growth is reliant on innovation and entrepreneurship, and we can’t leave our girls out of this brave new world. As the President has said, it really must be Computer Science for All. And we have to teach our girls to be brave in school and we have to teach them early in their careers, when it has the most potential to impact their lives and the lives of others. We have to show them that they will be accepted and loved — not for being perfect, but for being courageous. We need to encourage our girls to take on new challenges and approach them with excitement rather than dread. When we teach girls to be imperfect, and we help them leverage it, we will build a movement of young women who are brave and who will build a better world — for themselves, and for each and every one of us. Please note: The views and opinions expressed in this post do not necessarily reflect the official policy or position of the White House and the White House does not endorse all content herein. Nothing in this post shall constitute an endorsement of any products, companies, or organizations.